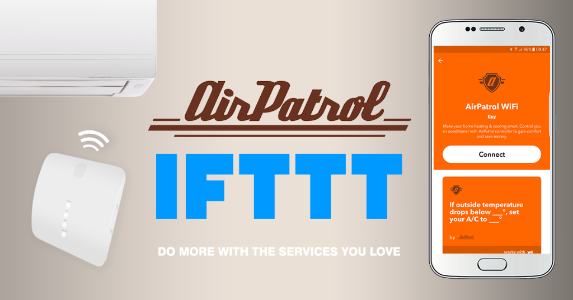 The AirPatrol team is proud to announce that the AirPatrol WiFI is now live on IFTTT. If you are unfamiliar, IFTTT, also knows as “If This, Then That”, is a free web-based service that allows users to create chains of simple conditional statements, called “Applets”. These are triggered based on changes to other web and smart home services such as Alexa, iOS, Android, and Google Maps. Now you can connect your AirPatrol WiFi with other smart gadgets and services and make your home and air conditioner even smarter. The AirPatrol team has already pre-made several Applets, including integrations with Alexa, iOS, Android, and Weather apps. Check out our IFTTT channel here, and read more about it on our blog. We hope you will find this useful, and if you have any awesome ideas for some new Applets make sure to let us know! For more information, please visit the AirPatrol IFTTT page. To purchase please visit our AirPatrol WiFi page.